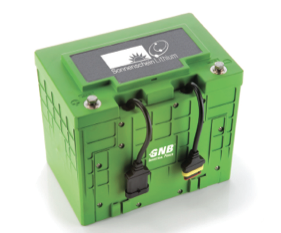 Sonnenschein Lithium is a range of 12, 18 and 36 Volt Lithium battery modules. These Lithium modules offer significant cycling, charge time, weight and volume improvements over similar lead acid battery modules. Sonnenschein Lithium modules are ideal when Advanced Energy Systems are required. Excellent float and cycle life with zero maintenance offers end-users significant cost of ownership savings and complete peace of mind, through safety inherent in Sonnenschein Lithium chemistry. The Sonnenschein Lithium Battery Management System is also designed to offer excellent control functionality (including remote monitoring) when coupled with Sonnen- schein Lithium Battery Modules. 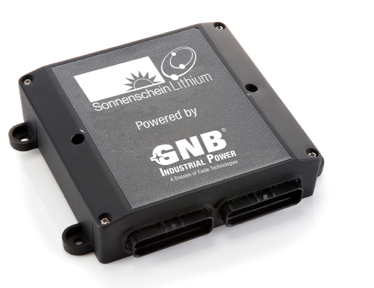 Sonnenschein Lithium monitoring and diagnostic kits are also available enabling system data recording and detailed performance status indicators. The SL24 40VHC module is a high-performance, 24-volt battery. Designed for high-power, short-duration discharges, this technology combines the power of lithium and the safety of phosphate, in a lightweight, versatile, building block. The SL24 40VHC module is ideal for mission-critical, power applications. The module’s inherent reliability, long cycle life, and zero maintenance offers end-users the assurance of 24/7 system uptime, while delivering significant cost of ownership savings. The Battery Management System (BMS) integrates seamlessly with the SL24 40VHC applications. The battery system is managed locally and real-time system information can be monitored worldwide. Sonnenschein Lithium offers a simple ‘plug-and-play’ replacement for typical lead-acid battery applications. The Lithium Ion modules offer 40Ahs and 20Ahs with a peak load capability of 80A and 60A respectively. Sonnenschein Lithium incorporates built-in automatic protection and does not require an external battery management system for optimum usage. Providing extended run-time with weight and size reduction when compared to Lead Acid. Sonnenschein Lithium LC is a perfect choice when low voltage, high energy density is required. The Sonnenschein Lithium LC modules provide excellent float and cycle life resulting in low operating costs and a high return on investment. This technology has been deployed commercially since 2006. The Sonnenschein Lithium BMS is designed to manage system safety, optimise system performance and control communication with the application and the outside world. The SLBMS is compatible with all HC and VHC Sonnenschein Lithium Ion modules. Sonnenschein Lithium Battery Management Systems (SL BMS) are designed for use with Sonnenschein Lithium battery modules. The BMS provides numerous system integration options facilitating temperature, voltage, current and state-of-charge monitoring for use with Sonnenschein Lithium HC and VHC battery modules. One single SL BMS is capable of managing up to 48 Sonnenschein Lithium battery modules. This technology has been deployed commercially since 2006.